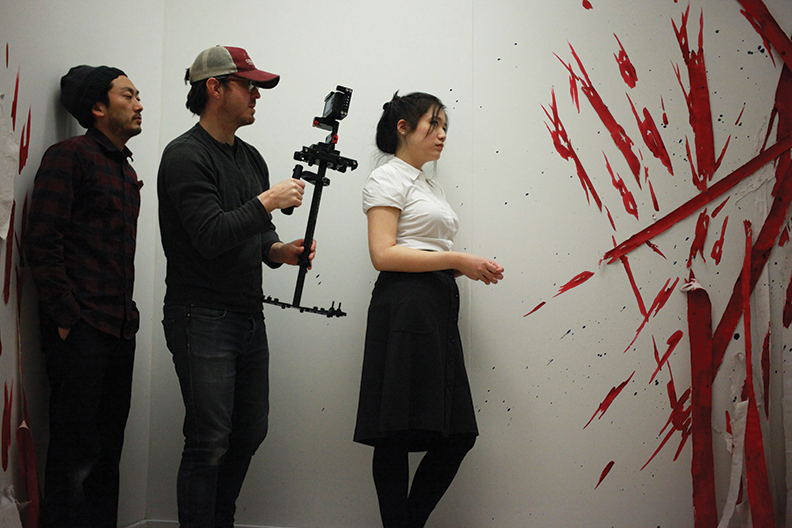 Director Eugene Park, cinematographer Tracy Pitts, and lead actor Wanda Jin in production for “Self-Deportation: The Untold Tale of a Marginal Woman.” Courtesy Conner Keeffe. Adams started the Bridgeport Film Club in 2012, seeking to unite independent Chicago filmmakers in a collective that could freely collaborate, without the same economic ties and dependence of a production company. The group organizes collective shoots, free script readings, critiques, and work-exchange programs, where filmmakers can volunteer their work in exchange for help in return. Membership is not exclusive; anyone who participates in a few script readings or uses the work-exchange program can be asked to join. At the moment, there are four or five members who meet regularly, as well as a number of volunteers and participants in the club’s different programs. “Self-Deportation” is a short film that balances surreal and allegorical elements with a socially- and politically-conscious tone. The film starts on the CTA, where an Asian-American businesswoman is confronted by other passengers, racially targeted, and told to “go back to your country.” In response, she builds a shipping crate and resolves to mail herself “home.” The film then presents the different representations of “real Americans” she comes across in her travels. She moves between these archetypal cutouts of traditional characters—firefighters, cheerleaders, politicians, and quarterbacks—on her way to a home that turns out to be New Jersey. In part, the film comes from Park’s own encounters with racism; he’s an Asian American, and is originally from New Jersey. But “Self-Deportation” is a film that seeks to communicate a broader message as well; the different characters encountered in the film are essentially unattainable stereotypes, with common and popular identities that anyone would have trouble calling their own. As a cinematic project, “Self-Deportation” shows how creative filmmakers are able to tackle and make the best of the challenges and opportunities that current technology presents. One of the film’s screenings will be at the Midwest Buddhist Temple, on September 27, where it will be paired with a live soundtrack. Adams and Park also hired Chicago-based artist Brittney Leeanne Williams as set designer for pre-production and filming in an effort to make the workspace as much of an art installation and performance space as it was a set. “Most set designers are just interior designers,” Park explains. “You give them money and they go into Crate and Barrel and buy things that look nice.” Williams didn’t do that. Her work, creating the space for conveying the different American personas of the film, is equal parts surreal and eye-catching. A dark living room set, littered with onions stuck to the walls and coming out of the furniture, provides the backdrop for the traditional family scene, and a construction of directionless and obtrusive ladders, reminiscent of M.C. Escher, is the space for the fireman scene. The sets are almost characters in themselves. When shooting was finished, an exhibition was held in Ukrainian Village with reconstructions of the film set. Crowds were invited to walk around the work and meet the film’s characters in a performance piece that invited audiences into the film mid-production. “Self-Deportation” is scheduled to premiere at Chicago Filmmakers on September 6, with additional viewings at 32 Forty, an art space in Bridgeport, as well as at The John Marshall Law School and the Midwest Buddhist Temple. Adams and Park are still looking for an editor to help them finish the project, and for other cinemas and festivals where the film can be shown.